Chenna: Raksha Bandhan is an Indian festival that epitomizes the unconditional vow of brother to protect their sisters. The true bond of love and care that brother and sister shares with each other illustrates many values like commitment, courage, discipline, respect, integrity and loyality which perfectly reflects the values of GoAir. 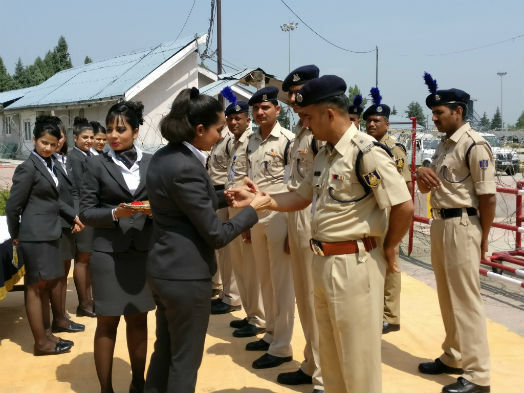 As the horizon of families are extending all over India, GoAir celebrated this bond of protection in a unique way by its in-flight Cabin crew tying Rakhi to the CRPF Jawans at Srinagar Airport, to express their feelings of love and respect for providing security to all those who fly in & out of Srinagar airport throughout the year. GoAir feels privileged to celebrate this occasion with CRPF Jawans.